Get your strawberry fruit salad, strawberry pretzel salad and spinach strawberry salad recipes here! 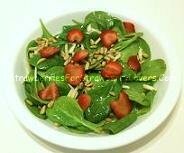 A Hearty Strawberry Spinach Salad! You've got to try these salads! A spinach and strawberry salad is not just another spinach salad with strawberries, it is a masterpiece! Strawberry fruit salad is a truly light and refreshing dish! And a strawberry pretzel salad... well, it's more of a no-bake desert. And wow, what a dessert! For strawberry salads, you can't find any place better than StrawberriesForStrawberryLovers.Com, Home of the World's Happiest Fruit!